Designing effective assessments is a key principle of instructional design. You want to have confidence that successful completion (a.k.a. passing) of the test(s) in your course is a true and reliable indicator that the learner has mastered the material. For more information on formative versus summative assessments please download our eLearning 101: A Practical Guide ebook. One way to improve the reliability of tests is to present different questions to each learner every time the test is taken. Randomizing your questions reduces the likelihood that the learner has, at best, memorized answers, is using the process of elimination on subsequent attempts to improve his or her score or, at worst, has been given the answers from other learners. Lectora® and Lectora® Online support this instructional tenet by allowing you to randomize tests or portions of tests. To set up a randomized test, the first thing you’ll need to do is add a test with questions. If you plan on incorporating test sections you should also include these upfront. All of these options are on the Test and Survey ribbon. 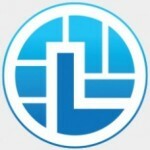 For more information on adding a test within Lectora or Lectora Online please reference our Test and Questions video. By default Lectora and Lectora Online create a “standard” test. This refers to a test without randomization and does not include the elements of your course located at your title level i.e. your theme or template. In standard tests you need to include the Process Test/Survey action, typically on the last page attached to a “Done” or “Submit” button. This is not necessary for a fully randomized test or if the last test section is randomized. Since Lectora is selecting the desired number of pages randomly from within the test, there is no way of knowing which page will be selected last. Therefore, Lectora will automatically process the test after the desired number of pages has been selected; e.g., when the learner leaves the 10th page in the example below. 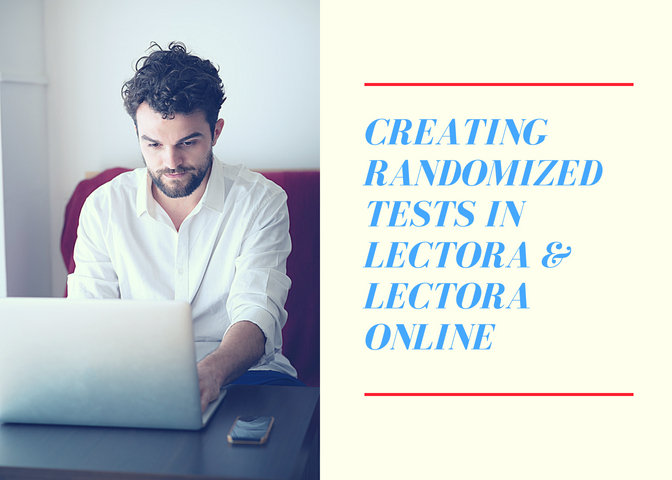 If you elect to randomize the entire test, Lectora will choose pages from among all of the pages in the test, regardless of the section containing them. In other words, the sections are treated as organizational only; the 10 pages for the test are pulled from ANY section. You can only randomize a test at the test level or test section(s) level. The use of both will cause errors. 1. 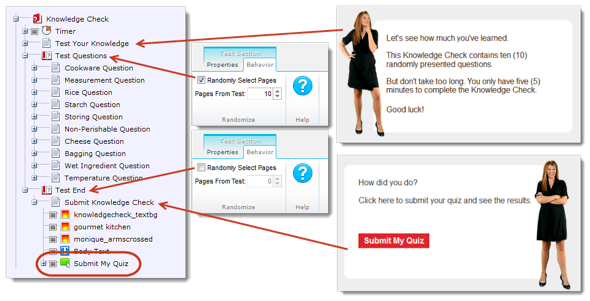 To randomize the entire test, select the checkbox next to Randomly Select Pages on the Test’s Behavior ribbon. 2. 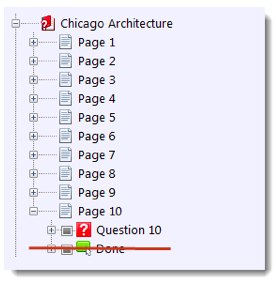 Then you’ll need to indicate how many pages the test should include in the Pages From Test. You can either select to randomize the test (the total number of questions) or a specific number of questions (a part of the whole) commonly known as a question pool. 1. 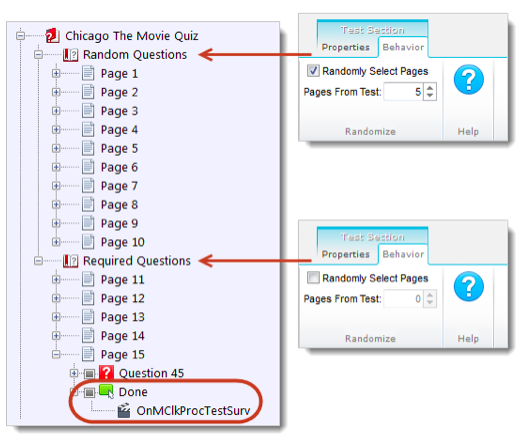 To randomize a test section, select the checkbox next to Randomly Select Pages on the test section’s Behavior ribbon. You can see this example in the Let’s Cook title which is available for preview and download. Remember that in all of these cases the test score is based on the point values of the questions presented. Therefore, if the point values vary by the question, the possible number of points totaling 100% will vary for each learner every time the test is taken. You will want to keep this in mind as you determine the Mastery Score (%) (i.e., the required minimum passing score) for the test. Also important to note is that multiple tests, randomized or not, will result in an average test score of all of the tests within an Assignable Unit (AU). When using randomization in any of the above circumstances it’s important to note that some course elements may no longer be appropriate. For example, if your page names include a numbering system and you’re using a page title auto text, the numbers will most likely appear out of order. Also, the name of the page in your browser will default to what is in your Title Explorer. So while you may have removed the page title from the page, it may still appear numbered in your browser tab. You may also want to reconsider any numbering systems you have within the test. It’s recommended that instead of using Page x of y that you change the naming convention to Question x of y. You can also adjust the Y value to include a fixed value which represents the total questions you intend on having the learner answer. As always, make sure your navigation is set up to properly support all functionality in place within your test. Any idea how to use a table of contents with a randomized test?